Who’s ready for some Slay-Those-Books (STB) looks? Okay, so I’m a little late on the whole back-to-school party, but that’s because I was deliberately late. Introvert late. If that doesn’t work as an excuse, well, even if I didn’t make it to the party, it’s never too late for some school outfit inspo. I’m sure that not everyone who reads this blog is in school, but these looks work in the classroom, or in the real world. Interestingly, even though INTJs are continuous learners, they may not particularly enjoy school. When you have to sit in an environment where you’ll be taking in a lot of information over a long period of time, comfort is a must. There’s nothing worse than your pesky inferior extroverted sensing raising the alarm and distracting you from the task at hand because you are uncomfortable. That’s why, for this STB look, I’ve gone with a soft, cotton maxi dress. Isn’t maxi short for maximum comfort? Unfortunately, according to Google’s 2016 Fashion Report, maxi dresses are on their way out. Before they go out of style completely, take your old maxis out for a few final spins this fall. What’s INTJ About this Slay-the-Books Look? This outfit works well for school. It’s modest, so fits within those school dress codes, and the muted colors could hardly be called distracting. The moto jacket keeps you extra warm in cold classrooms, or as you walk from the car to the building (if you live in a colder climate). The converse keep it casual and keep the comfort going. 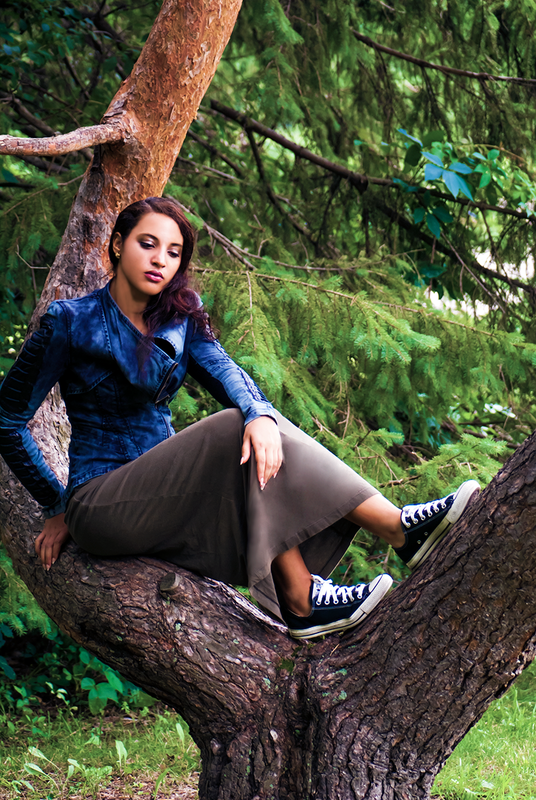 Converse paired with a moto jacket gives you major style cred. There are so many stresses involved with back-to-school: school supplies books, lunch table drama, dorms, roommates, classes, and homework. Figuring out fashion should be the least of your concerns. So, my motto for back-to-school slayage is this. Keep it simple. Keep it cool. Keep it you! Happy studying. Unmoto. Photo Credit: Mechelle Avey. Alwaysuttori.com. Copyright 2016. All Rights Reserved.